"Sampath Speaking" - the thoughts of an Insurer from Thiruvallikkeni: the story of Kanakambaram flower - முப்பது பைசா மூணு முழம். the story of Kanakambaram flower - முப்பது பைசா மூணு முழம். Right from Sangam literature, flowers have been integral part of Tamil lore – Malligai, Mullai, Sengagam, Lotus, Magizham, Rose, Lily, Vruchi, Senkanthal, Aambal, Anicham, Kurinji, Vaagai, Vagulam, Kongam ...... (பூக்கள் அழகானவை; நறுமணம் தர வல்லன:: மல்லிகை, முல்லை, செண்பகம், தாமரை,மகிழம், ரோஜா, அல்லி மற்றும் விருச்சி, செங்காந்தள்; ஆம்பல்; அனிச்சம்; குறிஞ்சி ;வாகை; வகுளம் ; கோங்கம்;) - என எவ்வளவோ நறுமலர்கள் உள்ளன. பூக்களை அழகாக தொடுத்து இறைவனுக்கு சாற்றி வழிபடுவது நெடுங்காலமாக உள்ளது. “முப்பது பைசா மூணு முழம்...... முல்லை மல்லிகை கனகாம்பரம்” – was a hit song of 1970s from film “Pookkari” (written by Vaali) – descriptive of not only the fragrance but also the economy – in that song, heroine (as flower seller) – would dance and sing, selling flowers – the lyrics – ‘3 measures of flowers – Mullai, Malligai, Kanakambaram – for 30 paise’ – yes, a measure for 10 paise – don’t immediately wander to thoughts of how much overpriced they are now – how less fragrant and loosely set they are now... the post is not about their price !! Crossandra infundibuliformis is a species of flowering plant in the family Acanthaceae, native to southern India and Sri Lanka. The common name "firecracker flower" refers to the seed pods, which are found after the flower has dried up, and tend to "explode" when near high humidity or rainfall. The "explosion" releases the seeds onto the ground, thereby creating new seedlings. It is popularly known as Kanakambaram in Tamil (கனகாம்பரம்), Malayalam and Telugu and Kanakambara in Kannada. In Maharashtra its known as Aboli. Now this news in TOI Chennai edition of 25th July 2014 titled : Shades of kanakambaram: Vanishing without a whiff – makes a sad reading though. It is about the flower with bright colour – one has no scent and losing out to rose and jasmine ... Once among the most vibrant flowers in the state, its saffron petals were the high light of every south Indian woman's hairdo, of every God's garland. Today, with rose and jasmine blooming in the flower market -both domestic and overseas -the kanakambaram appears to be wilting. Some blame it on fashion, others on fragrance, or the lack of it. 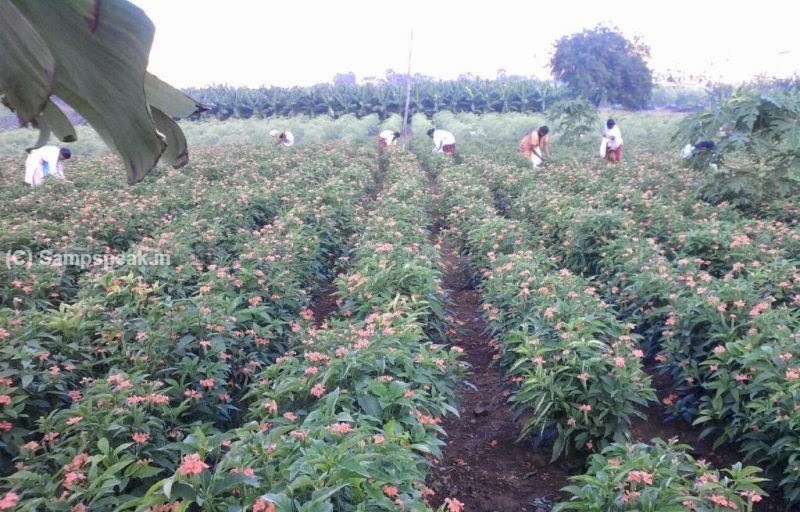 “They've simply gone out of fashion,“ says Pushpa Jothi Indra, an associate professor at Fatima University in Madurai, who wrote the book `Production And Marketing Of Crossandra In Dindigul District', which was published last year. She saw those flowers in abundances in 2006 when she was doing research for the book, but they are no longer found in the markets. Flower sellers in Kanyakumariand Madurai seem to agree with Pushpa. “People want value for money -why spend on something that has only colour but no scent?“ says a Kanyakumari-based flower wholesaler. According to Tirunelveli-based horticulturalist, kanakambaram lost out because its stubby stem and lacy thin petals make packaging difficult. “The rose for instance, has a long stem and therefore can be plucked as a bud and transported overseas. It will bloomin transport or at its destination. If you did the same to the kannakambaram, it would wilt,“ he adds. Still, the Crossandra has its crusaders. Among them is farmer-scientist T Vengadapathi Reddiar of Koodappa kkam village in Puducherry, who was awarded the Padma Shri in 2012 for his research on crossandra tissue culture. Using mutation breeding techniques, Reddiar has created a great number of varieties of the flower, all of them high yielding as well as disease-free. “When I started my research in 1972, the varieties of kanakambaram were pale orange and would spoil fast. They were losing market value,“ says Reddiar, who has over the years managed to create more than 75 hybrid varieties that are much brighter and in more colours (from pink and violet to orange and yellow). “There were two major setbacks to kanakambaram export,“ says Reddiar. “The flower was difficult to pluck and it would keep for only two to three days. In our newer varieties we have increased the shelf life to one week and have made the flowers easier to pluck,“ he adds, hoping this will help the flower return to bloom. 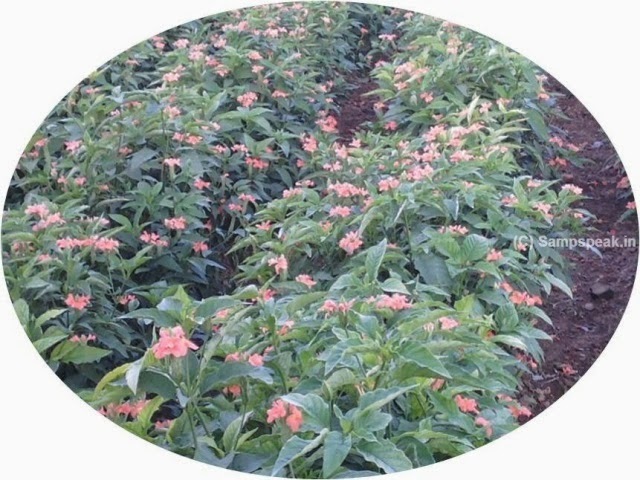 In his latest `mutation', Reddiar says he has created a high-yielding crossandra, which is more disease-resistant than any of the varieties he has grown before. “I am calling it the Modi kanakambaram after the Prime Minister,“ says Reddiar, adding that he has grand visions for this particular hybrid, much like Modi has grand plans for India. 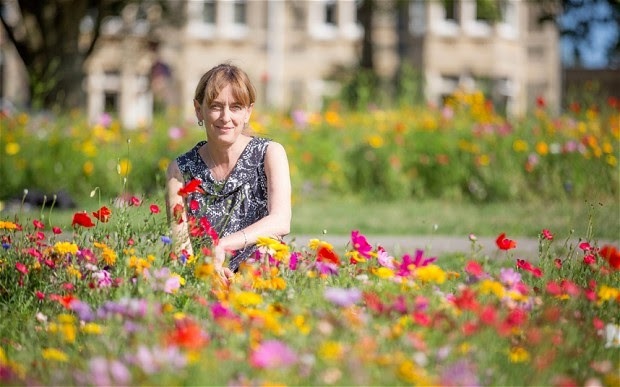 The photo you saw at the start is one at Bristol, the person seen is Sue Mountstevens, the Avon & Somerset Police and Crime Commissioner at St Andrews Park – where Police have spent £5,000 on a community flower garden in an attempt to combat anti-social behaviour, prompting a mixed response from the public. The scheme to use a floral display as a deterrent to miscreants and petty criminals in the St Andrew’s Park area of Bristol has received financial backing from Avon and Somerset Police and is claimed to have had a “remarkable effect”. Some are questioning the usage of public funds on this too. Kanakambaram in fields – photos courtesy my friend K Srinivasarao.